The American West has long been a place where myth and legend have flourished. Where men stood tall and lived rough. But that West is no more. In its place Shann Ray finds washedup basketball players, businessmen hiding addictions, and women fighting the inexplicable violence that wells up in these men. A son struggles to accept his father's apologies after surviving a childhood of beatings. Two men seek empty basketball hoops on a snowy night, hoping to relive past glory. A bull rider skips town and rides herd on an unruly mob of passengers as he searches for a thief on a train threading through Montana's Rocky Mountains. In these stories, Ray grapples with the terrible hurt we inflict on those we love, and finds that reconciliation, if far off, is at least possible. 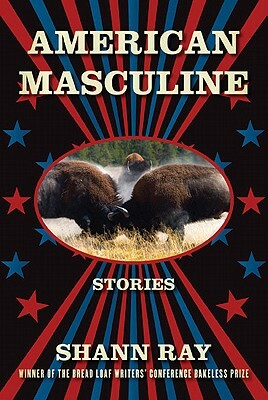 The debut of a writer who is out to redefine the contours of the American West, American Masculine is a deeply felt and fiercely written ode to the country we left behind. Shann Ray holds a PhD in psychology from the University of Alberta. His work has appeared in McSweeney’s, Narrative Magazine, and Story Quarterly. He teaches at Gonzaga University, and lives in Washington State.